I just loved this sketch when I saw it on Splitcoast last week, but with Christmas and all I hadn't got a chance to make it. 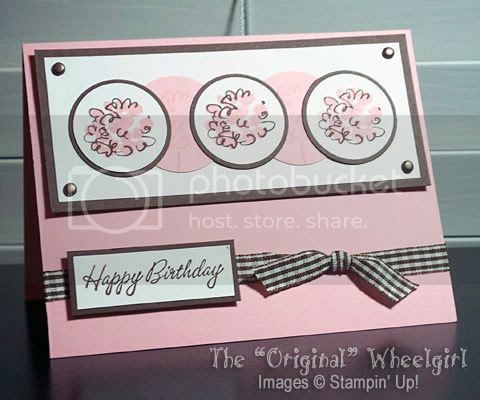 I had a great idea one morning this weekend as I lay in bed (contemplating whether to get up or not...lol) to make a pink and brown birthday card for my late brother's high school and beyond girlfriend (who is now married and has a baby boy). Greg died ten years ago, but we still keep in touch with Carmela because she meant so much to him. She's like a sister to me. Her birthday is on New Year's Eve, and I hope she likes the card. I used the puffball on a stick stamp from the Heartfelt Thanks set by SU! and Happy Birthday from the Warmest Regards set. The colors are Pretty in Pink, Chocolate Chip and Whisper White. I found some brown gingham ribbon and added some copper brads which are as close to brown as I could get. The circle punches I used are the 1 - 3/8 and 1 - 1/4 ones. I also used my Perfect Layers tool to get a 1/16 mat on the sentiment. Pretty sweet tool. Both the focal panel and sentiment are attached with SU dimensionals. Thanks for looking! The card is simply beautiful. She is going to love it. I'm sorry I didn't know about your brother. 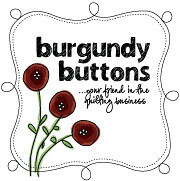 Hi there - just found your blog via SCS - LOVE IT!!! What a gorgeous card. These are MY colours - chocolate & pretty in pink. Have a 'thing' going on with them at the moment! Thanks so much.